Statistics suggest that about 10-20% of adults over the age of 65 are depressed. The number of older adults that are frail—which essentially means being weak and having a higher chance of getting injured—is also estimated to be similar. Both depression and frailty are associated with a number of negative effects in older age, such as a lower quality of life, increased use of health insurance and a higher chance of experiencing other health issues or dying. When both of these conditions are present at the same time, the effects can be even worse, with many of these individuals experiencing accelerated mental decline and disability. This shows why it’s important to understand the connection between depression and frailty, as it can help identify patients who are affected by either or both conditions, as well as to develop strategies to address them. Although there is some data available on this association, there are no large-scale studies that have focused on the two conditions exclusively. For this reason, a high-quality pair of studies called a systematic review and meta-analysis was conducted to determine how many older adults with frailty also have depression and vice versa. To conduct the review, researchers performed a search of three major medical databases for studies that investigated depression and frailty in adults with an average age of 60 years and older. To be included, studies also had to utilize respectable criteria for defining both depression and frailty, and had to include a control group of patients who did not have these conditions for comparison purposes. This search led to 63 studies being screened and 24 of these meeting the necessary criteria for inclusion into the review. Once collected, the findings from these 24 studies were evaluated and compared to one another to determine how common frailty and depression were in older adults. Results showed that there were 8,023 older adults that had frailty, and of these, 38.6% were also depressed. Similarly, 2,167 older adults were found to have depression, and 40.4% of them were also frail. Further analysis from five studies showed that when patients with depression were compared to individuals without depression, there was a significantly higher risk of also having frailty. Finally, the overall quality of the included studies was found to be good, which shows that these findings can be considered reliable. Taken together, this systematic review and meta-analysis show that a significant portion of older adults who are frail are also depressed, and vice versa. While this finding is alarming, the good news is this: treatment that targets either of these conditions can actually lead to improvements in both of them at the same time. Exercise, in particular, is an effective tool to manage both depression and frailty, as it leads to positive changes in both mental and physical health. 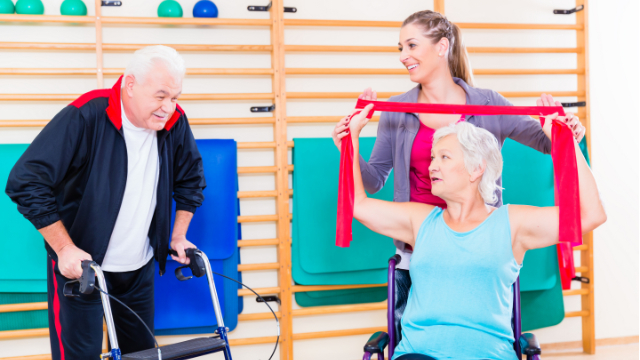 This is one of the primary reasons physical therapy is highly recommended for older adults with any type of impairment, since it is based on helping individuals move better and more frequently. With this in mind, elderly individuals who are frail or depressed—or both—are strongly encouraged to seek out the services of a physical therapist. Doing so can result in lasting changes in both their physical and mental health, and in turn, improve their overall quality of life.